The Nitro Stinger is the most revolutionary hunting shaft to ever come along. The exclusive parallel to taper design allows this shaft to be shot from any weight bow. The nock end of the shaft starts at 9/32" and tapers up to a full 21/64" through the last 13" of the shaft. This design allows a greater absorption of energy by the shaft, giving you flatter trajectory, more kinetic energy, and devastating penetration. 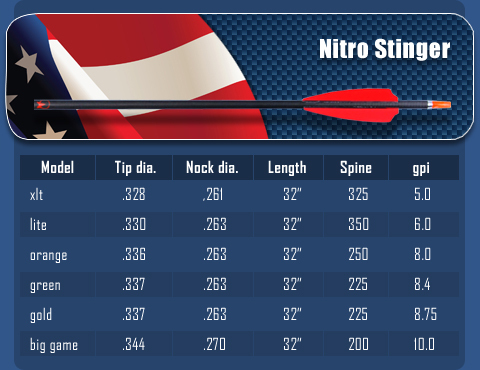 The Nitro Stinger allows for changing from field points to broad heads with little or no re-tuning necessary. Made in USA! Prices displayed are per 12 arrow SHAFT and include components.